Helping Heart Families » Kyle - Gavin's Got HeartGavin's Got Heart - Our mission is to spread congential heart defect (CHD) awareness while offering support to families with children affected by CHDs. Kyle Joseph Graham made his grand entrance into the world on January 19, 2014 at NewYork-Presbyterian Hospital/Morgan Stanley Children’s Hospital. He was diagnosed in utero with Hypoplastic Left Heart Syndrome (HLHS) and an intact atrial septum, so at four days old Dr. Emile Bacha performed open heart surgery, the Norwood procedure. The plan was to have his second surgery when he was 4-6 months old, but that was derailed when at a regular cardiology appointment his pulse oximetry reading (measurement of how much oxygen your blood is carrying) was low and Kyle needed to be admitted to the PICU at NYP/Morgan Stanley Children’s Hospital. The family was told Kyle couldn’t wait for his second surgery (the Glenn) and he needed it now. Since Dr. Bacha was unavailable, Dr. Quaegebeur (Dr. Q) and team, stepped in to do the surgery and Kyle was back home in six days. Kyle’s dad, Joe, once said having Dr. Q. do the surgery for Dr. Bacha was like having Lou Gehrig pinch hit for Babe Ruth. 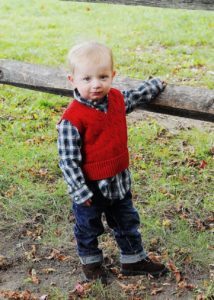 Today, Kyle is off all medications and developing perfectly like any other one year old boy. Gavin’s Got Heart welcomed the Grahams into the GGH family with open arms. Joe was able to be at the hospital when Kyle was born and their mortgage was paid on time which allowed for the Grahams to focus on the health of their son. “We are eternally grateful for all GGH did for our family. We don’t know what we would have done without them. GGH is such a blessing to the heart community by helping heart families through the most difficult time of their lives.” Heroes inspiring heroes.